Nancy Drew stood in front of her science class with an index card in her hand. Her best friends, George Fayne and Bess Marvin, were sitting in the back row. She stared down at the card, wanting to give everyone a clue that was good, but not too good. She didn’t want them to guess the answer right away. Jamal Jones’s hand shot up in the air. He always got straight As and had guessed the last two correct answers. Nancy held her breath, wondering if he’d get it right. “Are you a porcupine?” he asked. “Oh! You’re a hedgehog!” Jamal cried. “I want to see a ball python,” George said. “Those are terrifying!” Bess whispered. George and Bess were cousins, but they couldn’t have been more different. George had short brown hair and brown eyes, was athletic, and was not easily scared. Bess always feared the worst would happen, and Nancy had only ever seen her play sports in gym class. Together the three of them made up the Clue Crew. They worked together solving mysteries around River Heights. They’d even recovered a telescope that had been stolen from a local museum. Harry and Liam McCormick went to the front of the class. They were identical twins, with orange hair and freckles, and they liked doing presentations together whenever Mrs. Pak would let them. 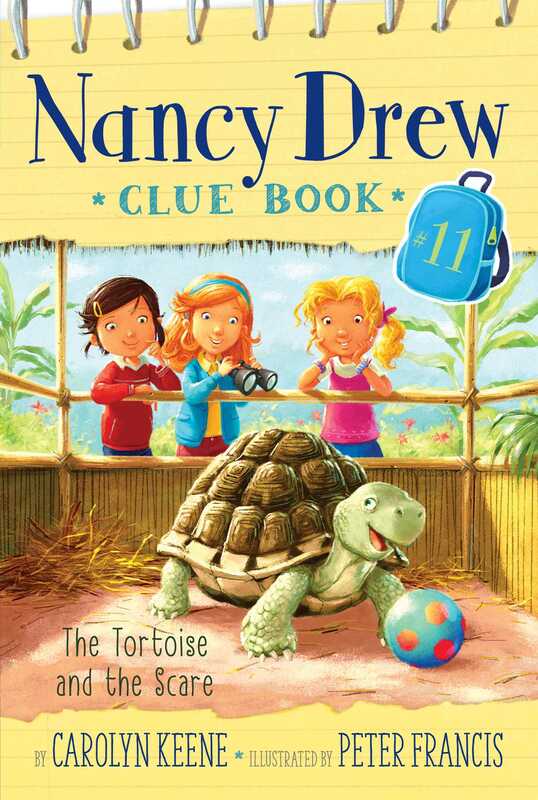 They’d just moved to River Heights in September, and were obsessed with Antonio Elefano, the biggest prankster in Nancy’s grade. The twins were constantly doing things to try to impress him. Just the week before they’d climbed thirty feet up a tree trying to get his attention. “And we have giant wings!” Harry added. Nancy thought they might be parrots . . . maybe sun conures, but that seemed too obvious. They’d been studying so many exotic animals that she sometimes got them mixed up. Was it possible they were scarlet macaws? “We’re very colorful,” Liam agreed. “That’s right! She’s right,” Liam said. He seemed excited that someone had guessed the correct answer, even though they were a bit confused about which bird the macaw was. Mrs. Pak moved on to the next lesson, pulling up a video of a three-toed sloth on the screen in front of the class. The furry creature was swimming. As the rest of the class watched it paddle through the water, Nancy leaned over to her friends. “George!” Nancy and Bess practically screamed. Then they broke into laughter, thinking of George with a giant snake hanging over her shoulders. Sometimes the things that totally creeped them out were the same things George loved. “I don’t think we’ve been somewhere this fun since . . . ,” Bess trailed off, her eyes wide. Nancy smiled, knowing it was true. The River Heights Wildlife Center was going to be their biggest adventure yet.